Jerusalem fits a microcosm of the whole world into less than 50 square miles. Black-hatted Jews in long trench coats walk the streets of religious neighborhoods in hot desert weather; Israeli Arabs reverently approach the Dome of the Rock to offer prayers; devout Christians make pilgrimages to the places Jesus once inhabited; and immigrants from America, Ethiopia and the former Soviet republics form their own enclaves throughout the city's seven hills. Remnants of disparate historical eras are piled, one on top of the other, in an archaeologist's dream world -- ancient sites meet Roman ruins alongside reminders of modern Israel's tumultuous past. And, in the midst of these holy and historic areas, Israelis go to work, shop, eat out and hang out like citizens of any other city. Most cruise travelers come to Jerusalem to see the religious sites of the Old City. Hectic, don't-waste-a-minute tours rush visitors to the Western Wall, Via Dolorosa, the Church of the Holy Sepulcher and then on to Bethlehem or one of Israel's famous museums (the Yad Vashem Holocaust Memorial or Israel Museum, home to the Dead Sea Scrolls). And, of course, a stop at a market or souvenir shop is a must. Unless you book an overnight tour with a private guide (many ships call in Haifa the day before or after, allowing for overnight stays in Israel) and plan your own itinerary, you will likely feel overwhelmed -- it's simply impossible to see everything at a leisurely pace in one day. 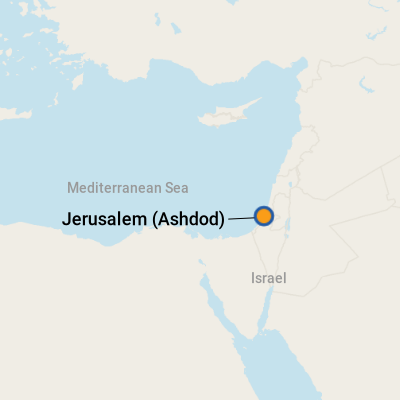 Part of the problem is that Jerusalem is located inland, so cruise ships must call at the Port of Ashdod, more than an hour's drive from the city -- and that's without the inevitable traffic delays. Despite the hassle, it's well worth the long day to see the holy places of three important religions, including the remains of the Jewish Second Temple, the site of Jesus' crucifixion and the spot where Mohammed ascended to heaven. Repeat visitors can opt for a more leisurely day, enjoying the shops and cafe culture at the Ben Yehuda Pedestrian Mall, haggling in the souk or shuk or visiting a number of first-rate museums. From Ashdod, alternate destinations include the beachside playground and cultural capital that is Tel Aviv, the dramatic yet melancholy ruins at Masada and the resorts by the Dead Sea. 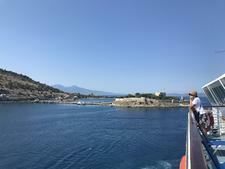 One final note -- even as cruise travelers eagerly book Eastern Mediterranean cruises to see the Holy Land, many continue to be concerned about safety. Yes, terrorist attacks and other violence occur in Israel but, because of this, security measures are extensive and effective. Armed guards are plentiful, your bags will be searched and you may be diverted from areas where tensions are high. Don't let fear prevent you from enjoying this incredible city, which truly can offer something for everyone. 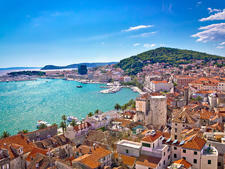 Just get a good night's sleep, put on your most comfortable walking shoes, charge the camera batteries and be prepared to be wowed by a city that has rightly claimed more than its fair share of space in the history books. Cruise ships dock at the Ashdod Port, Israel's busiest cargo port. While weekly cruises depart regularly from the port dock by the main cruise terminal, most visiting cruise ships dock in the middle of the industrial port, far from anything. Most lines will run shuttles to the main port gate or downtown Ashdod, since pedestrian traffic inside the port is prohibited. The main terminal offers a cafeteria, a currency exchange counter and two duty-free shops, but depending on where your ship docks, it might be difficult to get to the terminal building. The port is also far from the city of Ashdod. To get into town, take the shuttle to the main gate and a cab to Ashdod. 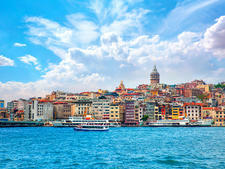 The city is not a big tourist destination, but it does have several shopping centers as well as a nice marina and waterfront promenade for a stroll or dining with a view. Many first-time visitors to Israel are concerned about safety issues, due to terrorist attacks that have taken place in Jerusalem and throughout the country. However, it's actually quite safe to travel in Jerusalem. The crime rate is low, though it's always smart to take precautions, such as keeping your valuables close in crowded areas and not walking through deserted areas alone at night. Security is quite tight, and security guards are often stationed outside restaurants and stores, and they patrol buses and public transportation terminals. Don't be surprised by the number of guns you will see while walking through the city's streets. Metal detectors are quite prevalent, and men may be patted down and asked if they're carrying a weapon. Emotions can run high in the Old City, if someone wants to engage you in a conversation on politics, it's best to say nothing and politely walk away. Consult the U.S. State Department's website (travel.state.gov) for up-to-date information on safe travel in Jerusalem and all of Israel. Many businesses in Israel close for the Jewish Sabbath, observed from sundown Friday to sundown Saturday. If you're in town on a Friday, get to must-see sites early since many places begin to shut down as early as 2 p.m.
By Ship Tour: The majority of cruise travelers take shore excursions or private tours that provide transportation from Ashdod to Jerusalem. We definitely recommend some type of guided tour because the Ashdod Port is far from most attractions (more than an hour's drive to Jerusalem), and the port itself is tricky to navigate and is not within walking distance of the city of Ashdod. It's not worth the increased transportation time and hassle to tour independently if you've never been to Israel before. Plus, a guide is invaluable for giving insight into the historic and religious importance of the sites you will be seeing in Jerusalem. By Taxi: If you're set on touring on your own, take the ship's shuttle to the main port gate, where you can catch a cab directly to Jerusalem. As always, negotiate the price in advance and check whether payment is only in shekels or if dollars are accepted. The currency is the New Israeli Shekel (NIS) or shekels. (See www.xe.com for current exchange rates.) Most ships will not change euros or dollars into shekels, but credit and debit cards are widely accepted. In Jerusalem, ATMs can be found at Zion Square and the Ben Yehuda Pedestrian Mall; not all ATMs accept foreign cards, so look for machines marked with signs for Cirrus, Plus or other international brands. ATMs are difficult to find in the Old City; if you need cash, go to currency exchange offices near the Damascus and Jaffa Gates. The port's main terminal also has a currency exchange office. Hebrew and Arabic are the official languages of Israel, but English is widely spoken -- especially in tourist areas. Signs are printed in Hebrew and English, if not in all three languages. English-language menus are often available. It's polite to learn a few words of Hebrew, if only for greeting people (shalom) and saying thank you (todah). Israeli cuisine is a hodgepodge of many cultures, incorporating Arab, Eastern European, Yemenite, North African, Balkan and Iraqi dishes. Salads, including the aptly named Israeli Salad -- a dish of diced cucumbers and tomatoes -- are popular. You can't go wrong with falafel (chickpea fritters), hummus (chickpea paste) or shwarma (shaved-meat sandwiches). Plenty of cheap and quick falafel places can be found in the Ben Yehuda area -- Melech Hafalafel, Moshiko Falafel and Pinati get rave reviews -- or around Mahane Yehuda. Kosher restaurants are prevalent in Jerusalem, and these establishments adhere to Jewish dietary laws. Kosher eateries are designated either as meat restaurants (where no dairy products are served) or dairy restaurants (where no meat is served, though fish is acceptable). Wherever you go, look for signs advertising "business lunches" -- they're a great deal because you get dinner-sized portions at lunchtime prices. Judaica, from chintzy souvenirs to fine art, can be found in the Jewish Quarter and the Ben Yehuda Pedestrian Mall. You'll find everything from Hanukkah menorahs (nine-branched candelabras) and seder plates for Passover to educational children's toys, jewelry, kipot (skull caps) and Jewish-themed art. Colorful Jerusalem candles, skin products (featuring mud from the Dead Sea) and colorful Armenian tiles and ceramics make great keepsakes for the non-religious folks on your gift list. In Bethlehem, look for olive wood carvings and mother-of-pearl handicrafts, many with Christian religious designs.